Weapons for sale at Mad River Armory and Range in Springfield. Ohio lawmakers are considering a long-debated bill that would roll back concealed-carry gun permit and training regulations. Some states have already passed similar controversial laws, while others have gone in the opposite direction to tighten gun sale, permit and background-check rules. Gun regulations across the country are a patchwork and following the differences between state and federal laws can be confusing. We were curious about just what Ohio gun laws do and don’t allow. For WYSO News, we sent Community Voices Producer Jason Reynolds to investigate. Here's some of what he found. At the Mad River Armory and Range in Springfield, around a dozen people are taking in some target practice using a wide variety of firearms. Mad River is also a gun store and one wall is lined with weapons. Owner Skip McGee stands in front a glass case full of handguns and explains the process for buying a gun. It starts, he says, with matching the buyer to the right weapon, but that’s just the start. Purchasing a gun at a store in America requires the buyer to submit to a federal background check. Under the law, background checks must come back in three business days, though McGee says buying a gun can take as little as 20 minutes. But there’s a catch, he says. If the federal system fails to process a background check within those three business days, the sale can still legally go through. McGee recalls that loophole led to a memorable situation when one background check didn’t come back within three days at Mad River. “The guy came in to pick the gun up. He’s standing here to get it. We’re back there getting it,” McGee says. That’s when the phone rang, he says. "It was FBI calling to say, nope -- where’s the gun at?" The sale stopped. But if the phone call had come in just a little later, McGee says, the gun could have ended up in the wrong hands. The government will typically step in to stop a sale for a number of reasons. The federal background check form buyers have to fill out asks a host of questions, including whether the buyer has been convicted of certain crimes, has a restraining order against them, or has a history of drug addiction or mental illness. The rules for buying a gun from an online store are the same: a buyer still has to go through a background check. So, McGee can’t legally ship a gun directly to a purchaser. Instead, he says he ships the weapon to a licensed firearms dealer located near the buyer for pickup. Despite all the rules, it’s pretty easy to avoid a background check and still legally buy a gun. That’s because there are different rules, depending on whether a gun is sold by a licensed dealer or sold by a private citizen at a gun show, for example. Other rules are similarly byzantine. Under federal law a person must be 21 years old to buy handgun from a licensed dealer but only has to be 18 years old to buy a shotgun or rifle, such as an AR-15. 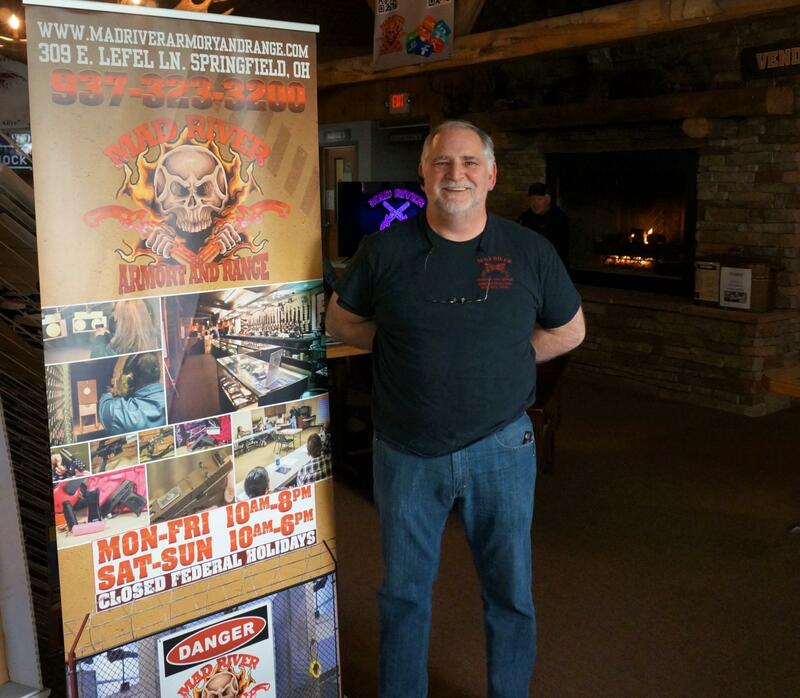 Mad River Armory and Range owner Skip McGee. First-time buyers are often surprised by the number of state and federal gun laws covering firearms in Ohio, he says. His main goal is to make sure customers walk away with a weapon that's right for them. Federally licensed dealers like McGee are required to run background checks on buyers but a private citizen who rents a booth at a show doesn’t. Many advocates say inconsistent background check rules are a problem. Toby Hoover founded the Ohio Coalition Against Gun Violence in the 1990s and says a lot people may be unaware of how easy it is to avoid a background check, be it at a gun show or on the street. Perhaps on the opposite end of the debate is Dean Rieck. He’s the executive director of the Buckeye Firearms Association, a pro-gun group that wants private gun transactions to follow the pattern of any other online sale. At what point does a person who is selling guns privately become a dealer? It's complicated. Buckeye Firearms supports measures to roll back concealed-carry laws. Right now, Ohioans who want to carry a concealed weapon have to take classes and be licensed. But that’s only if a person want to conceal a firearm. Ohio is a so-called open-carry state, which means person who can legally own a gun in Ohio is legally allowed to march down the street with that gun. They just can’t hide it. Rieck says that a “constitutional carry” policy, which would allow people to carry concealed weapons without classes or licensing, would be more sensible. Toby Hoover from the Ohio Coalition Against Gun Violence also thinks Ohio’s current open-carry and concealed-carry laws are illogical, but for different reasons. Hoover says she thinks Ohio would be wise to follow states where all gun owners are required to be licensed, not just people who want to conceal a weapon, and weapons are registered. “You know who owns what. If there is a problem, you can step in and say, we’re gonna hold you responsible not only for what you do, but that you don’t let somebody else get the gun," she says. Back at Springfield’s Mad River Armory and Range, owner Skip McGee says he’s more concerned with people’s safety than pushing an agenda. Regardless of what direction Ohio laws ultimately go, he says he’d like to see more gun owners take safety classes. And he thinks the best way to close the gun show loophole is to have licensed dealers facilitate gun show sales. McGee says he knows the country is divided on gun issues, but he’s hopeful that people can work together to keep guns out of the hands of the wrong people while still protecting critical Second Amendment rights. But McGee admits that sort of conversation would require listening, something perhaps all too rare in today’s gun debate.